So this is not a Paula Peck original recipe. In fact, although souffles are French and much of her work with James Beard was based on French recipes, I haven’t been able to find record of her making a souffle. When I asked my father about this, he had no recollection of her making one at all. It’s possible that somewhere between the issues of making sure that a souffle rises and the fact that it collapses within minutes after coming out of the oven, she found them to be too high maintenance for her minimalist approach to baking. – Do not over beat egg whites. – Do let egg whites stand very long (they will deflate). 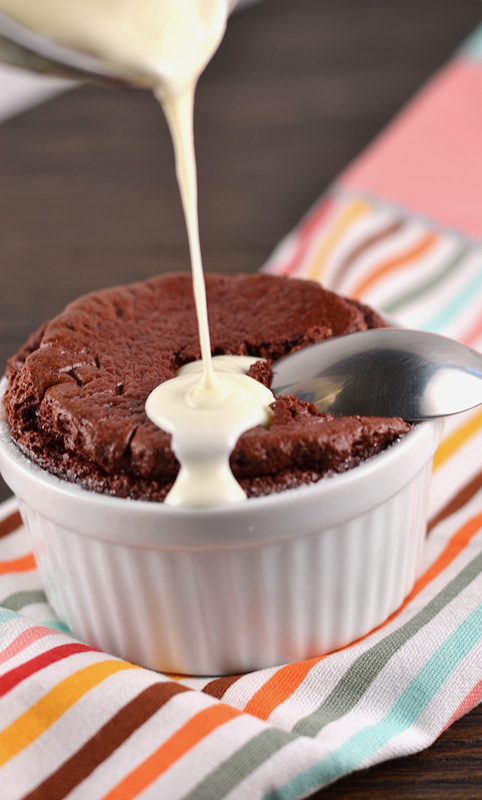 – Use a souffle mold with straight sides. – Coat the molds with butter but also either sugar, Parmesan, or bread crumbs. I believe this helps the souffle grip the sides and rise. 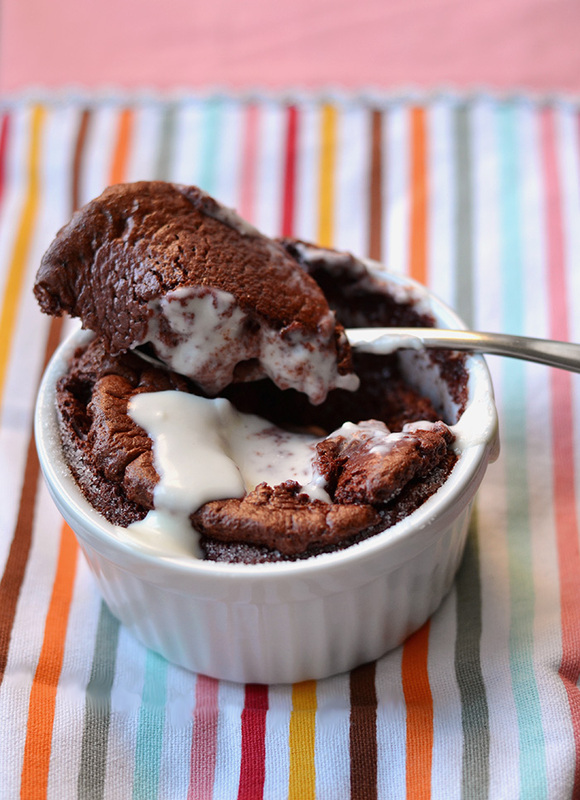 Since souffles are somewhat old fashioned, I wanted to make one with a modern twist. With the popularity of red velvet cake and my love of cream cheese frosting, I took on this what’s old is new challenge. 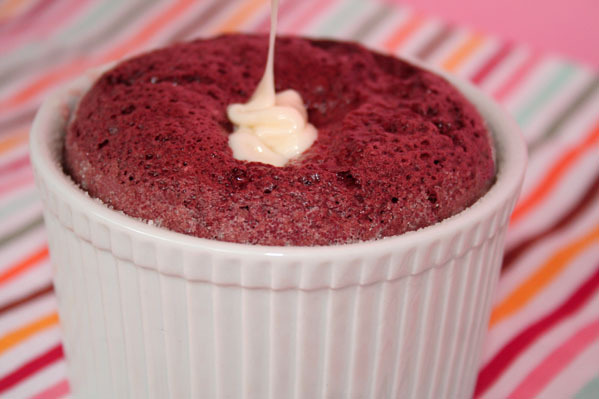 The resulting decadent warm red velvet chocolate souffle with a touch of sweet fruity Grand Marnier and tart cream cheese icing sauce definitely fits the bill. Preheat oven to 400 degrees. Coat four 8oz soufflé molds with butter and sugar. Refrigerate molds. Mix flour into softened butter. Bring milk to a boil. Thicken milk with butter flour mixture and cook for 2-3 minutes until thick. Remove from heat and add chocolate. When chocolate is melted, add egg yolks, one at a time, beating well after each addition. Beat in Grand Marnier and Vanilla. Add food coloring and mix (add enough food coloring for a deep red color). Whip the egg whites with pinch of salt. Gradually add sugar a little at a time. Whip until egg whites are stiff. Fold a quarter of the egg whites into chocolate base to lighten. Fold in remaining whites. Spoon or pour mixture into prepared molds, leaving a ¼ to the rim. Reduce oven temperature to 375 degrees and place molds in middle of the oven. Bake 10-15 minutes until puffed.